Heat a heavy bottom pan,add ghee and melt it. Add Rava and roast it medium flame for 2-3 mins.Don't burn it.Transfer the rava in to plate. Keep the same pan melt ghee in it,add the broken cashew and raisins roast it. Pour the water,add sugar mix well.Dissolve the sugar. Add the cardamom powder in it,mix well. Put kesari color,and mix again. Allow the water to bubbling/Boiling.,once it started boiling add the rava by one hand,stir the kesari in another hand.Avoid lumps. Mix well,cook it in medium flame.Pour remaining ghee in it. Once started to leave edges,transfer in to greased pan,let it cool for 15-20 mins.Then cut in to any desired shapes. Use any desired food color,to make kesari. You can use fine rava or course rava for making. 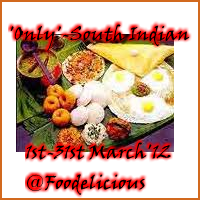 Linking this recipe to ongoing event, "South Indian Foods" @Foodelicious and to "Walk through memory lane" hosting by Roshan"
Love your presentation. My all time fav...love it love it!!! looks very attractive..loving the texture of the sweet!!awsum!! You have done it so well, looks delicious..
That first pics is so tempting. Nice presentation and the color looks so really tempting. I love these pictures and the colour. Prabha, the kesari looks so beautiful and well made. Thanks for linking it to ONLY event. Join me in..